Hosted by Cardozo’s FAME Center for Fashion, Arts, Media and Entertainment law, in conjunction with the Fashion Law Society, Cardozo’s Fashion Law Symposium event on February 26, 2019 attracted over 165 attendees and included 18 speakers. 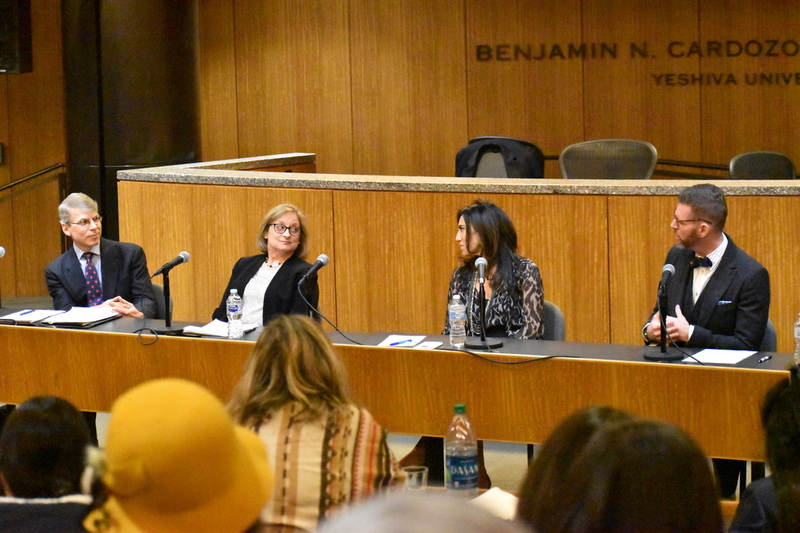 Attorneys, fashion industry figures and law students joined the Symposium to discuss several pertinent topics in the fashion industry and determine how to address these topics from a legal perspective. Following the topic of wearable tech, Douglas Hand moderated the 3rd panel of the day, dedicated to the Retail Revolution and how to utilize real estate in the digital age of shopping. One of the most influential lawyers in the field of fashion, Douglas also sits in the Business Advisory Committee of the CFDA and is an adjunct professor of Fashion Law at NYU School of Law and Cardozo School of Law.Can the stores win back the allegiance of customers by a tech revolution led by smart mirrors and connected dressing rooms? Can online shopping provide an answer to the famous try-before-you-buy weapon? With leaders of the front lines of fashion law, panelists Scott A. Klion, Of Counsel to HBA in the area of commercial leasing, Maryann Lawrence, Associate General Counsel at Chanel and Rory Tahari, Founder of the State of Mind Partners, discussed how to capture the customer of the future. The panel began with one of the main concerns of the fashion and retail industry, the closing of stores and malls everywhere across the country and the stores struggling to compete with online retailers. “We don’t look at stores as a profit center but as a marketing expense,” explained Rory Tahari. Her insight as director of Elie Tahari, Ltd. for 20 years, with stores located throughout the world foresees the end of the typical provisions in leases and rental agreements. For most landlords, the 10 year regular lease agreement is now becoming shorter and shorter as only a limited amount of brands are able to commit themselves to these agreements. However, according to Maryann Lawrence, the success and the visibility of a luxury brand like Chanel benefits from an incredible leverage when negotiating a lease with landlords. As previous Associate General Counsel for Tiffany & Co., Scott Kilon agreed with Lawrence’s analysis, adding that a landlord needs these brands in order to increase the value of the mall or the shopping area. In sum, retail is not dead. In order to revitalize an area of a city, stores are still installed as a way to attract customer traffic. In addition, customers will always enjoy the physical experience of shopping. A customer buying at Chanel enjoys the “human touch” given by the sales persons and the luxury service of being able to have a cocktail in the salon whilst shopping. The shopping experience in a luxury brand like Chanel has to be “fluid but thoughtful,” added Lawrence.